Astronomers recently announced that they have found a novel explanation for a rare type of super-luminous stellar explosion that may have produced a new type of object known as a quark star. Illustration of a supernova explosion. 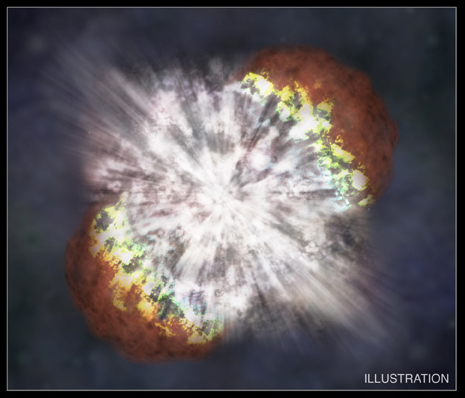 Three exceptionally luminous supernovae explosions have been observed in recent years. 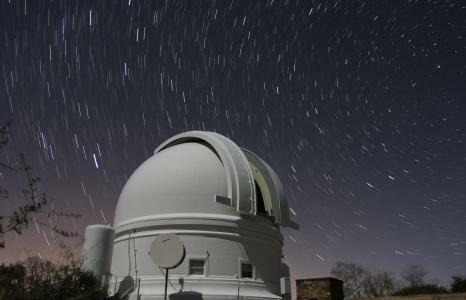 One of them was first observed using a robotic telescope at Caltech's Palomar Observatory. Data collected with Palomar's Samuel Oschin Telescope was transmitted from the remote mountain site in southern California to astronomers via the High-Performance Wireless Research and Education Network (HPWREN). The Nearby Supernova Factory research group at the Lawrence Berkeley Laboratory reported the co-discovery of the supernova, known as SN2005gj. Researchers in Canada have analyzed this, along with two other supernovae, and believe that they each may be the signature of the explosive conversion of a neutron star into a quark star. The objects are the three most luminous supernovae ever observed, and have been difficult to explain. The Canadian research team feels that the explosions herald the creation of a previously unobserved and new class of object known as quark stars. The most compact objects known to exist are neutron stars. Neutron stars are about one and a half times the mass of our Sun, yet compressed to only 16 miles across. A neutron star is formed as the core of a massive star collapses while the star's outer layers are blown apart producing a supernova explosion. These ultra-dense objects are made up of neutrons tightly packed together. If a neutron star becomes too dense it may collapse further to produce a second explosion resulting in a quark star. As it does neutrons break down into their component parts, quarks, releasing more energy forming a second explosion, the Quark-Nova, which converts the neutron star into a quark star. Photo by Scott Kardel of the Palomar Observatory's 48 inch Samuel Oschin Telescope, with the 6' HPWREN antenna that was used for the 45Mbps link, and which has since been upgraded to an 8' antenna in support of 155Mbps connectivity with the Palomar Observatory. Further observations should help to confirm or defeat the hypothesis of quark stars but in either case the use of a high-speed network like HPWREN helps Palomar Observatory and astronomers across the world to continue to explore the frontiers of space.